The primary challenge at the 560-acre Killeen Castle estate was presented by the sheer scale and multifaceted nature of the project. This included construction of an 18 hole Jack Nicklaus signature golf course, the design and construction of the prestigious clubhouse, a long game academy and the Dave Pelz short game academy. McCarthy & Associates also project managed the master plan activities which included the renovation and restoration of a 12th Century Castle, design of a 5 Star hotel, the development of a highly sophisticated civil infrastructure (roads, utilities, etc.) and a state of the art telecoms infrastructure. The site also has one of the most extensive landscaping programmes carried out in Europe over the last 2 years. McCarthy & Associates played a vital role in attaining the planning permission for the 162 premium residences. This involved meeting all the key stakeholders and managing the overall preparation of the planning application. In addition, the entire development was to be completed to five-star standards and beyond. Our role included appointing the many different members of the project team, involving a tremendously complex mix of professionals, and delivering the overall project on time, within the client’s budget expectations, and to the most demanding of quality specifications. We were also responsible for project managing the planning process, which took on an additional layer of complexity due to conservation/archaeological issues and other constraints. A further challenge was presented by the requirements of our client for an exceptionally comprehensive and faithful restoration of the 12th century castle to its original state, to form part of a contemporary hotel. We were charged with managing the complex problems associated with restoration of this nature and also the seamless integration of the castle into a modern hotel building – but without compromising its historical status. We assembled an exceptional project team made up of an extraordinary diverse range of disciplines for each element of the overall project i.e. 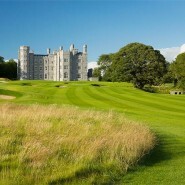 golf, hotel, civil infrastructure and castle. We managed that cross-functional team, ensuring that they fully understood the client brief and that they delivered on time and within the client’s budget expectations. We also implemented a detailed reporting structure, which kept the client totally informed, but without transferring the onus of responsibility back onto the client. In essence, we became the client’s representative on site, taking total responsibility for the final outcome of this magnificent project. A specific example of this was the exceptionally beautiful castle restoration. We assembled a design team for that element of the project which boasted an exceptional level of expertise. We also optimised the contrasting expertise through selection of specialists within areas such as plastering, joinery, stone-masonry and general restoration etc. We implemented a comprehensive communications process involving all relevant parties and developed a programme which had buy-in across the board. We also went to exceptional lengths to adhere to the most demanding of conservation restrictions. Visitors to Killeen Castle will see immediately that the project has been delivered to the highest quality standards – we have exceeded the expectations of our client and despite the exceptionally complex nature of the project, we have brought it in on time and within our client’s budget expectations, delivering a project which will be a legacy to the client for generations to come.